Celestron is the trademark of Celestron International. This page is not associated with Celestron International. Graphics shamelessly lifted from Celestron Webpage. Dedicated to the 8" Celestron Schmidt-Cassegrain Telescope. A guide to owning and using a C-8. 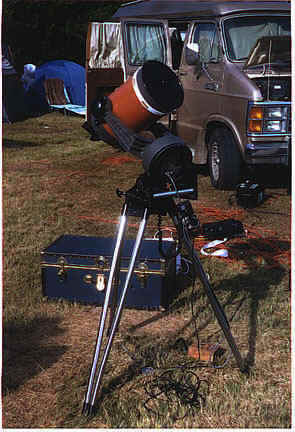 The author's C-8 ready for a night of observing at the 1996 Winter Star Party in the Florida Keys. Dark and steady skies bring out the best in your telescope. You can help with accurate collimation and polar alignment.